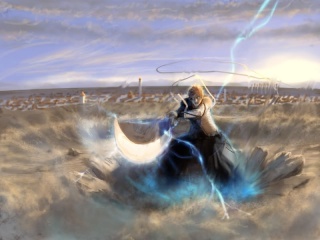 The shinigami are still caught in a battle against the Espada and Sosuke Aizen. But the battle to stop the formation of the kings key has called down the Shinseina as well. The sacred Shinigami. Sakura shook her head and smiled as she accepted the rose and blushed at the kiss then all but laughed sweetly when he ran off to the water's edge as if he where a school boy nervous with his first crush. She walked towards him watching him skip rocks her heart skipping a few beats earlier, she smiled as she stopped near him sliding the red rose into her hair while looking out at the water's edge. "Thank you the rose is lovely." She said warmly then glanced over at him before looking out at the water before her. Sakura all but melted into the kiss. Her eyes closing as her fingers touched his chest. She didn't think it was possible for anyone to be able to kiss like that but he could. It was as if he approached kissing the same way as fighting, with everything he had. She returned the deep passion of the kiss she was being given. Still able to feel the heat of the blush on her cheeks in no hurry to break the kiss at the moment either. Sakura half opened her eyes to look at him. A faint blush staining her cheeks. "Same here." She said as she wrapped her legs about his waist to hold on as he lifted her up into the air. Her arms around his shoulders she looked at him and a moment thru heavy lidded eyes not breaking the kiss they where caught up in. Although she wasn't sure she was ready for anything further at the moment. Sakura continued to the kiss alittle longer before breaking for the sole purpose of needing to breath. She rested her head against his shoulder for a bit before taking a deep breath and sighing. She wasn't ready for things to go too fast since they just met but nor was she in any hurry to be put down either. She sat up a little and looked at him smiling as she did before kissing him again softly on the lips this time she was the the one who kissed him instead of the other way around. Sakura moaned and closed her eyes tipping her head as he bit down on the side of her neck she didn't feel nervous about it yet, nothing too forward,but the bit of foreplay did have her blushing and moaning softly. Sakura hmmd and kissed along his jawline her heart skipping a few beats unaware that his Zanpkauto was responding to what they were doing. Her eyes closed as her heart skipped a few beats still feeling him playing at her neck. Sakura flushed bright red seeing his apolgitic look and staring for a moment shocked by the Zanpakuto who was currently manhandling her chest again. She reached up and grabbed the wrist of the girl. "Stop it." She protested stepping back she didn't feel comfortable with things moving that fast she just met him! And now all the sudden she was being assulted a second time by an over zealous Spirit?!? Cherry blossom petals swirled as a lovely woman appeared arms crossed although she was not solid Zakurkadoguchi was not happy either. "My master as asked you to stop several times now." She looked at her cherry blossoms littering the ground and shook her head. "Leave them be, not all you come across must be yours." Sakura looked over and paled at the way things where going. "Zakurakadoguchi?!" She askead looking at her. "Please, lets not start unnessary fighting right now." "There will be no fight, as long as she does not attempt to do this any longer." The sky was darkening and the air taking on a rather frigid chill as Zakurakadoguchi stood there snow began to fall. AS if creating the world of cherry blossoms and snow that was Sakura's inner world in the physical one. "If Sakura tells you no, then it is no.You have no right to force anything on her." Sakura took a deep breath feeling like things where about to get really bad. "Zakurakadoguchi please...." She said again looking at her and shaking her head her father had told her once that the spirits battling directly was a very very bad thing.....and she really didn't want to see what would happen once they started. Zakurakadoguchi bowed deeply at the waist. "All I am concerned about is that my ladies wishes are heard and not ignored. Even if no harm was meant by it." She said in a polite tone then faded back. The snow and cherry blossoms fading out as well. Sakura took a deep breath and looked at him. "Well....we're probably going to have to figure out how to work things out if we continue on with this relationship." She said looking at him it was clear that she had no intention of breaking anything off at the moment that was up to him. "But I have to find a way to let Benishihone know that my interest although no offense is meant, is not with her but with her Shinigami." She said shrugging lightly and no offense was meant. She just wasn't interested in girls,not that way. Ryo looked at her very surprised... then he said "Her.... shinigami...." Did that mean she wanted him? Did she mean that she had feelings for him? "Good luck with that she's very determined.... but I will definately stay with you...." He grabbed her waist and kissed her deeply..... did he love her? "I noticed, I'm sure we'll have many arguements on that one..." Sakura mused then blinked when he wrapped his arms around her waist and pulled her close for another kiss. She wrapped her arms around his neck and returned the kiss that was given to her with equal passion, leaning up a little into him and savoring the moment. Sakura hummed into the kiss still returning the passion she was given, and when lifted into the air she wrapped her legs amost instinctively around his waist to hold on. Her arms going around his shoulders. She was in hurry to break the kiss. Sakura shivered at the feel of his fingers scratching lightly at her back, and when he bit her neck, she knew she'd have 'love-bites' everywhere he had bitten down on her, but the feeling was so pleasurable and intense it was hard to get upset about it. She closed her eyes and felt her own fingers bend slightly as they tangled in his hair and her other hand tensed against his back a little. She did have deep feelings for him but was unsure of them at the moment. Of what they meant wither it was simple deep attraction or love. If it was love he would certainly be her first, and if he was her first then he would be the first to melt a little of her icy heart, when it came to letting other close to her. Sakura looked up at him a moment as he nipped her shoulder gasping a little before leaning her head down and kissing along his neck and down. Laying light nipping kisses, although things didn't feel to risk'e yet she would know when they did. Hopefully without upseting Ryo.